From brandnames and logos to sponsorships and advertising - sports are a big sell for the tobacco industry. This extensive list of examples from around the world proves that hardly a sport is immune from the tobacco industry, not even fishing! Football/soccer, golf, hockey, rodeo, darts, bicycle racing, rugby, snooker, horse racing, basketball, car racing, table tennis, cricket, American football (in the Philippines), you name it - the tobacco industry has it covered! The tobacco industry in Cameroon is a major sponsor of sports, football in particular. 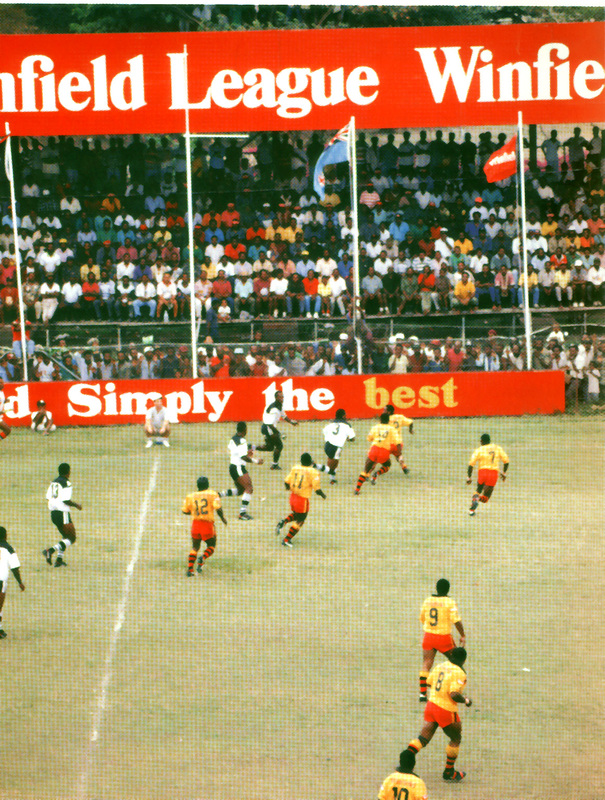 In Cameroon, football is the "king" of all sports. The tobacco industry targets many youth teams, e.g. children and teenagers who get involved with football in their neighborhoods (typically between the ages of 7-12). During the holidays, the tobacco industry sponsors championship games. BAT is a big sponsor here in the Congo. BAT offers our athletes and our sportsmen bicycles and t-shirts. They also give our sportsmen shirts imprinted with their product name/logo, e.g. TOBACCO CONGO or EMBASSY, with a ball. The young are highly impressioned by this and influenced to start using tobacco. [however] are in fact sponsored by Marlboro. In my country, BAT has been sponsoring some sports by supplying T-Shirts and Boots. The most common/popular sports are football, golf and hockey. The tobacco industry is using these young players to promote their killer-products. Therefore, Anti-tobacco NGOs and the international community must join hands to halt this bad practice to help save our youngsters from lung cancer and other heart diseases. 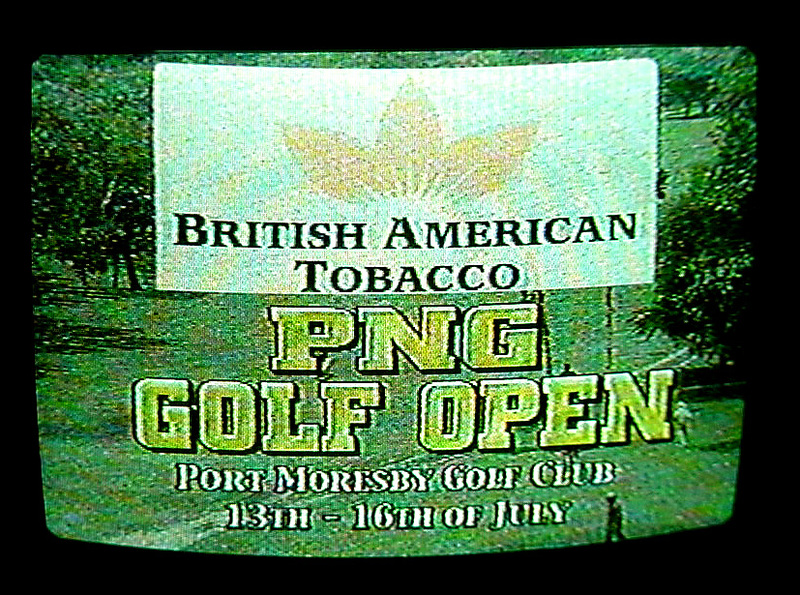 The ' Public Health Act ' was amended in Maurice in 1999 to introduce a ban on any form of advertisement or sponsorship by the tobacco industry, following an anti-tobacco demonstration during the 'Matinée Cup' of horse races. These new regulations were a hard blow to BAT's indirect advertising, which relied heavily on sports sponsorship, as these old ads document: snooker, golf, badminton. According to rumours, BAT continues to sponsor small scale sports in villages and to offer sports equipment, but without much media hype. Mauritian newspapers continue to relay advertisements of Marlboro through big full page color photos of Formula 1. Until recently, the only TV channel of Mauritius, the MBC, presented a sports broadcast containing a fixed close-up of a Marlboro Ferrari. There is a RED & WHITE (a popular cigarette brand) Snookers championship in Pakistan. Spear Central Province Country Cup (cricket event) was another BAT sponsorship. 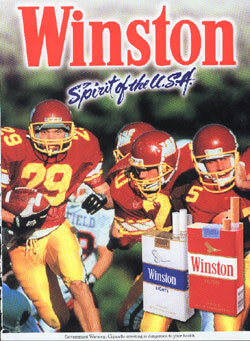 This Winston ad which features an American football scene and the slogan "Spirit of the USA," came from a Philippine Airlines in-flight magazine. American football also isn't popular in the Philippines. Camelia Sports is one of the oldest cigarette brands in Senegal. Its symbol is a football. 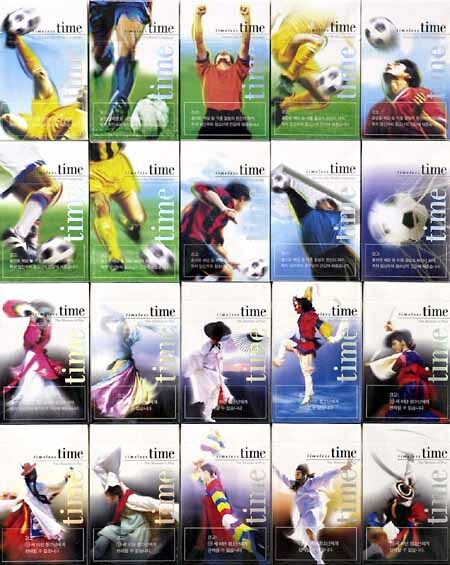 View the Time2002 packs go to: ALL, CLOSEUP. called the Bristol Cup. At the same time Bristol also organized and sponsored a cycle race. 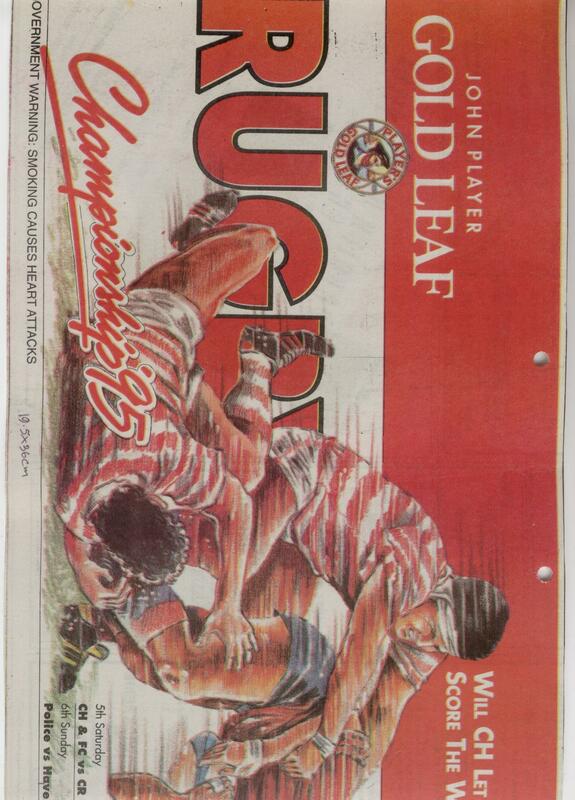 Rugby was also sponsored by Gold Leaf at one time but sponsorship of this sport has now been given to Carlsberg Beer. 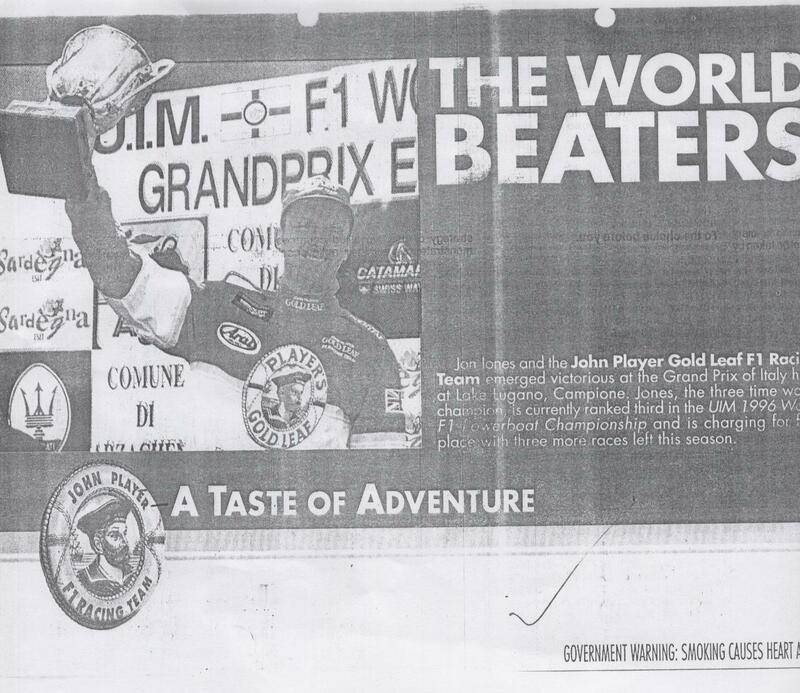 Gold Leaf & Formula 1 car racing. In Sri Lanka the tobacco industry does not play a very big role in the sports sector since a directorate made by the President in 2001 prevents sports authorities from accepting sponsorships from Tobacco companies. Although this is the case, the chairman of the Cricket Board in Sri Lanka also happens to be a Legal Advisor at Ceylon Tobacco Company(CTC). This being the case there is an increase in the sale, advertising and promoting of tobacco (especially B&H) during cricket matches. Mobile stalls are freely available and advertisements of cigarettes are easy to come by around the cricket grounds. B&H being a sponsor for cricket matches is flaunted in the souvenir without any reserve or shame. There is a national policy on tobacco which is as yet in the making. This policy would include a ban on tobacco industry sponsorship of sports events and a ban on selling, advertising and promoting such products on the sports field/ground. We also have heard that that certain athletes who have brought honour to our country have been offered special gifts/medals by the tobacco company. BAT's involvement in sports dates back to 1928. It has been involved in sponsorship of cricket, darts, table tennis and fishing. They currently sponsor a football league, Kakungulu Sportsman's Cup and an annual golf tournament in two leading golf clubs. The new market entrant Park, upon arrival in Kampala was a part sponsor of the region's top football event, the East and Central Africa Challenge Cup (CECAFA). BAT recently relinquished the main sponsorship of an annual sportsman's gala. This was a function organised by the Uganda Sports Press Association to crown the best sports personalities of the year. 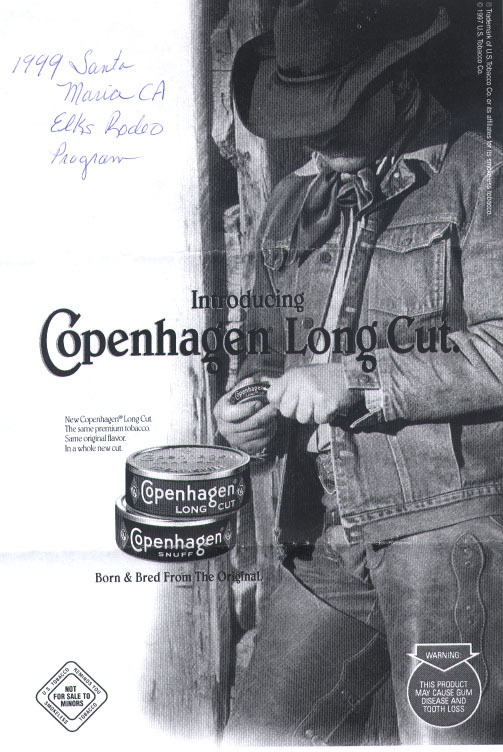 The sponsorship was dropped after pressure by anti-tobacco activists. BAT maintain that it is preposterous to link BAT's sponsorship to smoking initiation, which they attribute to peer and family influence. They maintain that their products are not intended for persons below the age of 18, and on this basis have twice refused to award prizes to event winners. BAT is also a large sponsor in the motor rally field. It sponsors a team called "Sportsmans" and its members are required to wear the brand colours of Sportsman". 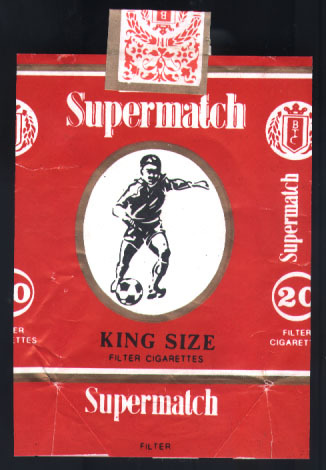 Brand names like "Sportsman", "Champion" and "Supermatch" all seek to build on the false association between sporting ability and smoking that the tobacco industry has tried to foster. Sportsman features a jockey and a horse's head while Champion depicts a man holding a trophy above his head. Supermatch takes it closer to home and shows a man dribbling a ball with the false legend "the winner's choice". Several sporting associations and notably the Uganda Amateur Boxing Federation, decline to accept sponsorship from BAT. UPDATE: BAT recently annouced that it would withdraw from all sports sponsorship. veiled ad for the brand with an average of ten Winston name mentions or logo pictures per page. Easter bunnies), in a Rite-Aid store. Like most racing cars, this chocolate car was covered in corporate logos, including a small "Winston" logo. Winston is the main sponsor of the "Winston Cup." Portland has a race with Indy-type cars each year. In 2000, it was won by the Marlboro sponsored vehicle. 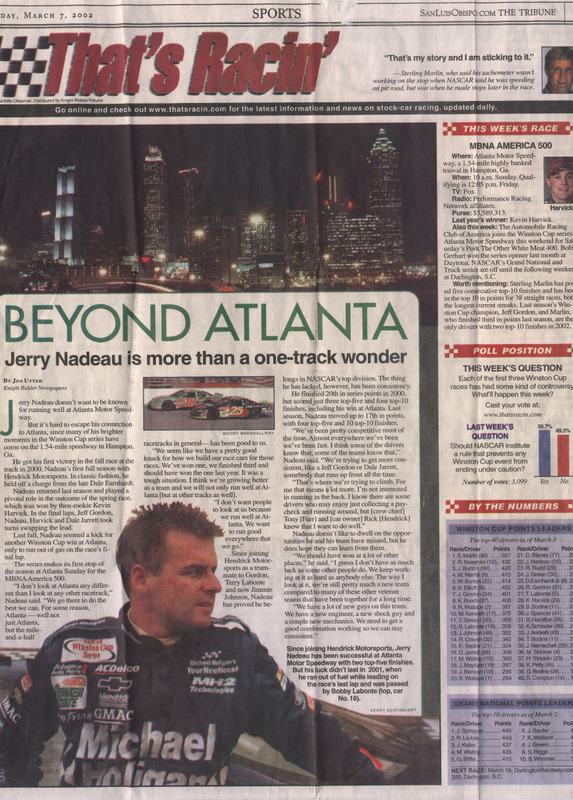 When our statewide newspaper decided to do a special section to introduce the race in 2001, the entire front page of that section was covered by a photo of the Marlboro car and about 6-7 men in Marlboro suits jumping up in the air. A great ad, and for free, too! and a national soccer event. 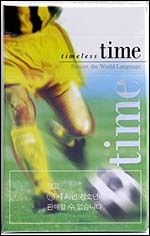 the program's success, a national rollout is recommended for 1988.